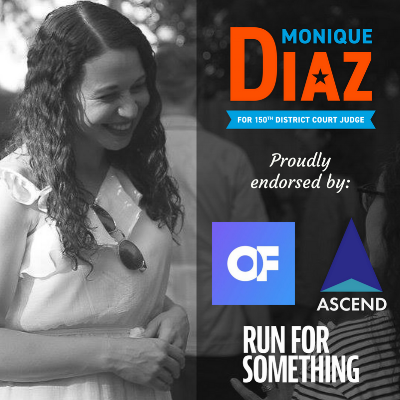 Today, we're proud to share that this grassroots campaign has caught the attention of three national organizations: Ascend, Opportunity First, and Run for Something! Each was started to help local, first-time candidates like Monique get the resources & support they need to win big in influential races. We're thrilled to be selected by each, and so appreciative for their support. We earned each of these endorsements because of people like YOU. Your support -- blockwalking, phone banking, fundraising, and even building our digital presence -- is what caught their eye. 1. Donate now so we can keep the pressure up. 2. RSVP to our next blockwalk to support our Get Out the Vote efforts. 3. Keep liking, sharing, and commenting on our posts online. There are only 88 days left until Election Day, and we're fired up - but we can't do it without you. This is the time to get involved however you can. Let's go win this together.